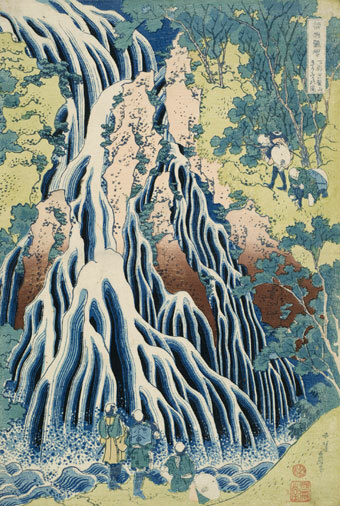 Katsushika Hokusai, The Falling Mist Waterfall at Mount Kurokami in Shimotsuke Province, 1833-1834, ôban nishiki-e (color woodblock print). Portland has a long history of trade and cultural interchange with East Asia, and this engagement is reflected in the Portland Art Museum’s Asian art collection. The origins of the collection can be traced to work donated by some of the Museum’s founding trustees. The collection has grown steadily, especially in Chinese, Japanese, and Korean artworks, the majority of which have been gifts from Portland individuals and families. Exhibited on the main floor of the Main Building, the Asian art collection today totals nearly 4,000 objects. Since 1932, when the Museum received the gift of the Mary Andrews Ladd collection of nearly 800 Japanese prints, the institution has been renowned for the depth and breadth of its holdings in this ever–popular medium. Subsequent gifts have expanded the Japanese print collection to more than 1,800 examples and broadened its range to include contemporary art. The Museum’s Japanese collection is also rich in painting and decorative arts of the Edo (1615–1868) and Meiji (1868–1912) periods. The Chinese collection covers a much broader span of time, from the Neolithic to the modern periods, with strong representation in ceramics — primarily tomb objects — from the Han (206 BCE–220 CE) and Tang (618–907) dynasties. In the last few years, major gifts of Han and pre–Han objects from the Arlene and Harold Schnitzer Collection of Early Chinese Art have brought new prominence to the Museum’s holdings in this area. Few museums in the world can match in scale and quality the array of ceramic court nobles, dancers, and musicians — not to mention dogs, horses, and supernatural creatures — in the Museum’s Chinese collection. Other holdings in Chinese art include furnishings and decorative arts. The Korean collection, though smaller in size than the Japanese or Chinese collections, also covers a relatively broad time span. The collection includes items dating from the 4th century to the present day, while providing an introduction to the major aesthetic and technical developments in Korean art from the 1st century CE to today. Highlights include a folding screen decorated with fanciful calligraphy (Munjado), representing the eight Confucian virtues; two portraits of 19th–century scholars; and furnishings typical of upper–class homes of the late Joseon dynasty (1392–1910). A small but significant group of Islamic and Indian paintings and South Asian Buddhist art add geographical breadth to the Asian holdings. 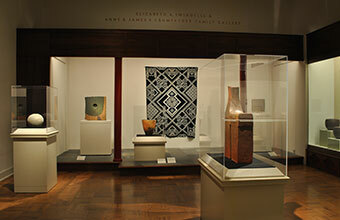 In 1997, the Museum converted the first floor of the Hirsch Wing (built in 1938) into a suite of four galleries, specifically designed to showcase objects from the Asian collection. This effectively doubled the amount of space devoted to Asian art and made it possible — for the first time in the Museum’s history — to dedicate separate galleries to the arts of China, Japan, and Korea. The Museum has since added two more galleries to this suite to showcase Chinese art.